A great sized package for range fun. 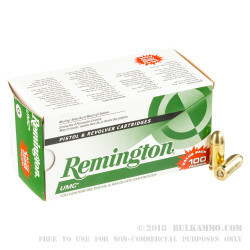 This already proven reliable ammunition in the UMC line by Remington is a good choice for bulk shooting and offers convenient packs of 100 for range use by those who need to top off their range practice from time to time. 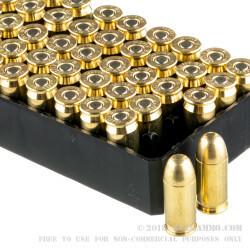 The 100 round range value packs also offer convenient carrying blocks for those who have groups at the range or want to make sure everyone gets a chance to shoot their favorite firearm. 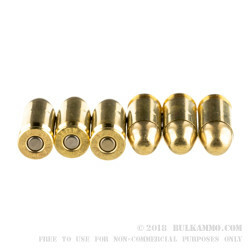 This .45ACP load is a 230 grain hardball ammo with a Brass case and a Boxer primer that has been doing the rounds at ranges everywhere for decades. 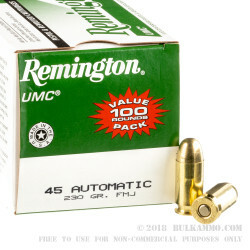 Remington UMC is a legitimate American mainstay with the historical performance of the line and the brand name and the continued use of high quality components and very consistent load specifications. This load is a big portion of the sales over the history of this line, as it is a quintessential American caliber from a quintessential American brand name. Known for its reliability in feeding and delivering accurate hard-hitting performance, the “hardball” load is the 230 grain FMJ round nosed .45 Auto cartridge. There may be no more legitimately engrained cartridges in the American shooting tapestry than this cartridge. This Remington example is about as true to form as possible. Q: If I keep JHP for home defense would shooting this MC round for practice feel any different? A: It is not likely that you would notice a difference between standard pressure .45 ACP 230gr FMJ and standard pressure .45 ACP 230gr JHP. Differences may be noted between +P and standard pressure ammunition, as well as lighter weight JHP projectiles traveling at higher speeds.